Japanese cooking utilises a lot of ingredients that are hard to come by in the UK and other countries. One of Japan Centre’s main aims is to bring Japan’s most exclusive foods to the UK, so that residents here can experience the many wonders of Japanese cuisine for themselves. Now we are taking this aim one step further with our new and exclusive range of thinly sliced meats. Some well-known and well-loved dishes in Japanese cuisine, such as sukiyaki and shabu shabu hotpots, shogayaki ginger pork, and yakiniku barbecue, require the use of thinly sliced beef or thinly sliced pork. Thinly sliced meat is readily available in most supermarkets in Japan, but here in the UK it is next to impossible to come by, even in specialised delis and butchers. Therefore, Japan Centre will now be slicing and offering the most frequently used cuts of beef and pork both in-store and online. Wagyu beef is coveted by chefs and foodies across the world, and rightfully so. No other meat is quite so breath-taking in quality. ‘Wagyu’ literally means ‘Japanese Cow’, and it is any one of four Japanese breeds that have signature genetic predispositions. What makes the meat so special? It should be immediately apparent, and you’re not dreaming. The marbling you see in this beef is real, caused by a greater amount of intramuscular fat than lean cuts. With a melting point as low as room temperature, this beef almost dissolves in your mouth upon impact, unleashing a gloriously rich and buttery umami flavour. There are some things in life you will never forget: trying wagyu beef is one of them. The term ‘yakiniku’ means ‘grilled meat’ and can refer to any grilled meat dish. For the most part, however, ‘yakiniku’ refers to a particular kind of Japanese/Korean barbecue restaurant, where the meat is cooked communally on a hot plate in the centre of a table. 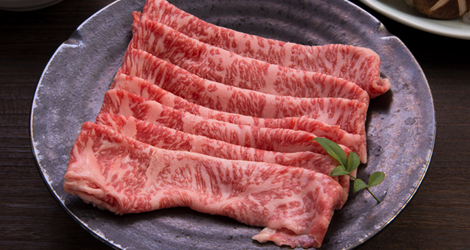 Yakiniku meat tends to be a little thicker than other thinly sliced meats, measuring between 3-5mm in thickness. Beef has a long and interesting history in Japanese cuisine. The eating of beef was seen as taboo for hundreds of years after Buddhism arrived in the country, and once the beef-eating restrictions were lifted, beef was a luxury that only the rich could afford. Today beef is enjoyed widely in Japan, whether in the form of steaks, burgers, or in thin slices as part of a hotpot or barbecue. Japan Centre's thinly sliced chuck roll is ideal for preparing mouthwatering beef dishes like sukiyaki and shabu shabu. Sukiyaki is a Japanese hotpot dish that was developed during Japan’s Meiji era. It is prepared by boiling the sliced meat (usually beef), proteins, and vegetables together in a sweet/savoury broth of soy sauce, sugar, and mirin. The meats, vegetables and proteins are then fished out and dipped in raw egg before being eaten. Shabu shabu is another hotpot dish, made by adding sliced vegetables and proteins to a hotpot of boiling water or dashi soup stock, and then swishing sliced meat (usually beef) around the boiling hotpot water to cook it. The meat used in these two dishes is very similar. The only difference is that shabu shabu meat needs to be able to cook in a much shorter time, so it is sliced very thinly (approx. 1mm in width). Sukiyaki has more time to cook, so the meat thickness typically ranges between 1.5-3mm. Pork is easily the most frequently-consumed meat in Japan today. Like beef, pork was outlawed as an unacceptable foodstuff in Japan for about a thousand years, until the Meiji restoration saw the Japanese people suddenly being encouraged to eat as much meat as possible. Pork was a relatively cheap meat to produce, which, along with phenomenal popularity of the humble tonkatsu (a breaded and deep-fried pork cutlet), led to pork's popularity among the general populace. At japancentre.com we now have thinly sliced pork loin and pork belly available for cooking up legendary Japanese pork dishes. Shogayaki, or grilled ginger pork, is believed to be Japan's second-favourite pork-based dish (after tonkatsu). To make shogayaki, thinly sliced pork is marinated in ginger, soy sauce, cooking sake and mirin rice wine, then pan-fried until heated through and served with rice and/or shredded cabbage. The exciting flavours infuse with the pork, and make for a perfect dinner meal or as a tasty addition to your bento. Sliced shogayaki meat is normally similar in thickness to sukiyaki meat (1.5-3.0mm). All of our meat is prepared in our temperature-controlled kitchen. To cut the thinnest, most tender meat slices possible, good-quality cuts of beef and pork (beef chuck roll, pork belly, and pork loin) are cut against the grain with a meat slicer. Although it is possible to get quite thin slices using a knife and a practiced hand, there is always a chance that the thickness of the individual slices will vary. As well as this, meat cut with a knife needs to be at least partially frozen before cutting, so that it remains rigid and each slice remains uniform. By using a slicer, the meat can be cut thinly and uniformly without the need to freeze it. After the meat is cut, it is packaged in special vacuum-seal bags, which are then packed straight into polystyrene boxes with plenty of cool ice packs. Finally, the meat is delivered to the customer's door with Before Noon Delivery.